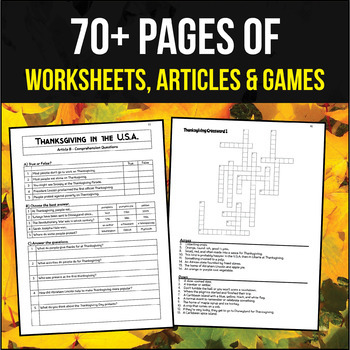 This pack contains a range of activities about Thanksgiving and the countries that celebrate it. It is designed for various abilities, with activities ranging from drawing and coloring to essay responses to complex historical issues. The pack begins with an introduction to Thanksgiving in four countries that celebrate it - the U.S.A., Canada, Liberia, and Grenada. Students can work through differentiated reading comprehension tasks, vocabulary sheets, and festival comparison activities using Venn diagrams. There are also milling activities and an interactive PowerPoint quiz. From this basis, the second half of the pack investigates the four countries in more depth, looking at timelines of key historical events, leading into deep research, analysis, and essay writing, with an emphasis on summarizing, giving opinions, and critical thinking. 3 Thanksgiving articles plus reading comprehension questions, each including 3 versions of different difficulty (9 articles + questions total). 4 country time lines, one for each of the main countries that celebrate Thanksgiving + an extended set of follow-up / comprehension activities. 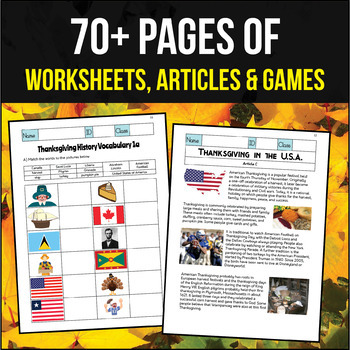 Vocabulary worksheets and vocabulary lists. 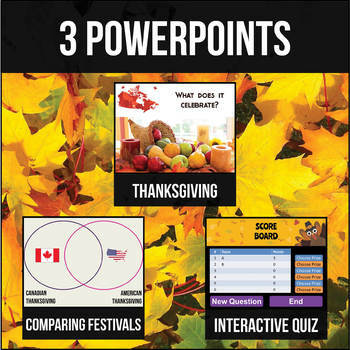 3 Thanksgiving quizzes, including a student question sheet and a a set of double-sided question and answer cards. 1 Interactive PowerPoint Quiz. This uses all of the questions from the three quizzes, plus many additional questions. It’s based around the ‘bomb quiz’ idea in which teams answer questions then pick a random prize (e.g. +1 point, -1 point, lose all your points). Teacher guide with suggested plan of activities. American and British English versions of worksheets are included. This download is a zip file including PowerPoint Presentations and PDFs. You will need zip extraction software, PowerPoint, a PDF reader, and a printer to use it fully. To make full use of the interactive PowerPoint quiz, you will need to enable VBA and Active-X within PowerPoint. A guide on how to do this is included.